What is Brett Favres Fantasy Value? We've all seen the charade that has become Brett Favre's career. It's really just been a circus. Has that diminished his fantasy value? Well, essentially he had none to begin with. Aaron Rodgers has been designated the go-to guy and WILL be the Green Bay Packers opening day quarterback barring injury. 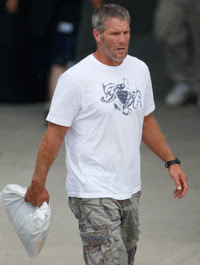 Where does that leave Brett Favre? According to the NFL Network's Adam Schefter, Favre spoke to both the Buccaneers and Jets on Tuesday to discuss a possible trade with either of the two clubs. That still leaves Favre in a Quarterback battle where it may still question his fantasy value. In Tampa Bay there is Jeff Garcia, Brian Griese, Luke McCown, Chris Simms, and recently drafted Josh Johnson. In New York, it's not nearly as bad a situation, but Chad Pennington and Kellen Clemens to deal with. Just like last year, Brett Favre may be entering the season with little to none fantasy value. But, just like last year, he may surprise us. Adam "Pacman" Jones can join the Dallas Cowboys, but hasn't technically been unsuspended. He has been granted allowance to participate in off season workouts and practice. He could join the team as early as today. Commissioner Roger Goodell will decide by September 1st whether to fully end the suspension or not. If Jones can keep straight for the next few months, we should see him on the field this regular season. Jones played a total of 30 games for the Tennessee Titans. He accumulated a total of 115 tackles and 4 interceptions. He was valuable on special teams as well. He has recorded 4 punt return TDs. Dallas traded a fourth round pick in this years draft to acquire Pacman Jones. If he plays that investment should pay off. With the pick the Tennessee Titans chose wide receiver Lavelle Hawkins.